Located in the centre of Mahendra Highway adjacent to Narayani River, Bharatpur is the gateway to Nepal’s wildlife at Chitwan National Park. Bharatpur has different multinational companies, governmental offices, colleges, big hospitals and banks. Bharatpur is the fourth largest city of Nepal after Kathmandu, Pokhara and Lalitpur. The city is growing rapidly in development and serves as a commercial centre for Chitwan District. Bharatpur is where Nepal’s first hospital was established to provide treatments and prevention against cancer. It is known by Bharatpur Cancer Hospital also called as B.P Koirala Memorial Cancer Hospital. Moreover, Rampur Campus affiliated with the Institute of Agriculture and Animal Science (IAAS) is situated in Bharatpur, Chitwan. It is the oldest campus of Nepal providing quality education to students looking forward to making a career in agriculture. Bharatpur is a hub for processing foods that arrive from Chitwan - the food surplus district. Narayangadh or Narayanghat is an important trading centre of the Bharatpur city. Bharatpur also has large poultry industries. Most of the people are involved in the business of poultry and it is highly exported to other parts. Bharatpur is the gateway to Nepal’s first national park, i.e Chitwan National Park. Chitwan is so named from the combination of two Nepali words, “Chitta” meaning he art and “ban” or “wan” meaning jungle or forest. Therefore, many call Chitwan the “Heart of the Jungle.” Chitwan National Park is listed as a UNESCO World Heritage site, for its abundance of wildlife and flora. Covering an area of 932 sq.km, in Nepal’s lowlands, Chitwan National Park is home to endangered species like the Royal Bengal Tiger, One horned rhino and the Asiatic elephant. If you go for a jungle safari, you might get a chance to see them in their natural habitat. Furthermore, various conservation projects and efforts to ensure that the flora and fauna of Chitwan National Park are preserved. Along with wildlife observation you can visit Sauraha, a small and quaint village. In the village you can observe Tharu community people and know about their daily lifestyles. Their houses and artworks are quite famous. Another interesting places to visit in Sauraha is the Elephant Breeding Center. It was established in 1985 in order to protect the endangered elephants. At Chitwan, you also enjoy the splendid sunset and sunrise view from Rapti River and the panoramic views of the mountains to the northwest. Bishazari Tal literally translates to 20,000 lakes. It is aptly named due to the many small lakes you’ll find in the vicinity. The lake is home to mammals like tigers and rhinos and reptiles like crocodiles, gharial, etc. The Vulture Restaurant also known as Jatayu Restaurant is the first Vulture feeding site in Nepal. It lies in the buffer zone of Chitwan National Park. It has been established by Namuna Community Forest to protect endangered species of vulture. A Vulture Restaurant is a unique concept among the conservation community restaurant for vultures where safe food is provided to vultures. One of the best things about travelling to a place is to try the popular food in that area. Taas is a spicy fried goat-meat which is very popular in Bharatpur. It is usually served with Bhuja or Cheura. Don't miss the opportunity to taste Tharu cuisine. There are several restaurants in Sauraha serving these traditional style foods. Other foods to try out are Ghonghi (a popular snail delicacy of the Tharu community) and Nepali Thali set offering several classic dishes of Nepal. Devghat is an auspicious site for Hindus as there is a strong belief that many gods had visited this place including Lord Ram and Sita. It is located 7 km away from Bharatpur city. The significant rivers, Kali Gandaki coming through Muktinath (also known as the holy abode of Lord Vishnu) and Trishuli (known to be driven by Lord Shiva’s Trishul) meets here. During the last stage of life, people live here and spend their time meditating and worshiping for salvation. It has an area of 54.34 square kilometers and a number of religious sites are located here. Some of the interesting sites are Triveni Temple, Balmiki Ashram and the Someswar Kalika Temple. During Maghe Sakranti, devotees come to Devghat and take holy dips in the river to clean their sins. Ganesthan Temple is aptly named after Lord Ganesh, the deity residing in the temple. It is located at Bharatpur Ward No. 11 in the Chitwan District of Nepal. It is said to be constructed by King of Palpa initially and later on, King Mahendra reconstructed it in a modern way. It is mostly visited on Tuesdays by people from different parts of the city to worship Hindu Deity Ganesha. Similarly, another temple constructed by King of Palpa known as Bageshwari Temple lies in the Devghat area development district. Chitwan district has lots more Hindu temples such as Harihar Temple, Mahakaleshwar Shiva Mandir, Kalika Temple, Jakhadi Mai Temple, Durga Temple, Pashupatinath Temple and Rameshwar Temple belonging to several significant Hindu deities. Maula Kalika is a famous Hindu temple dedicated to Goddess Kalika. It is situated in Gaindakot town of Nawalparasi district. Located 561 meters above the sea level on the top of the Maula hill on the north of Narayani River, Maula Kalika is the best hiking spot while at Bharatpur. If not, you can use any other convenient means of transport to reach there. Every year, tourists visit this temple during peak times, i.e. (September-October and March-April). The best time to travel here is during Dashain, the main festival of Hindus. During this festive season, Nav Durga known as the 9 different incarnations of Goddess Kalika is worshipped. If you want more to explore more of Nepal, visit Kathmandu, Biratnagar, Birgunj, Nepalgunj and Pokhara. They can be easily accessed from Bharatpur. While at Bharatpur, your top adventurous spot is Chitwan National Park. 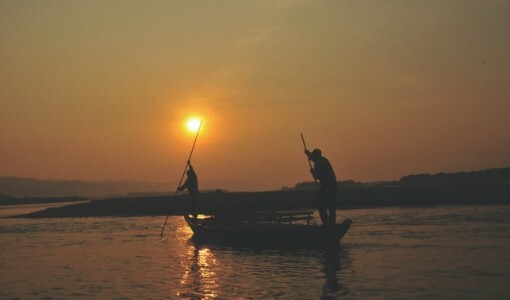 It is the best place to carry out activities like boating, feeding birds and animals, watching sunr ise and sunset from the Rapti River, etc. Jungle safari is the top thing to do in Chitwan National Park. 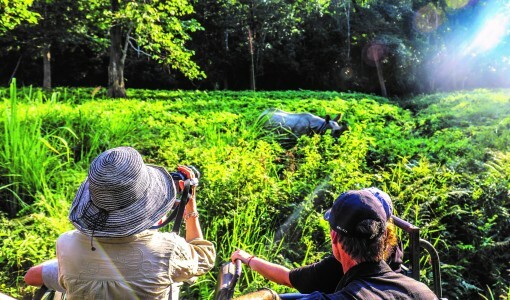 It can be done through jeep safaris, elephant safaris or a simple guided or unguided jungle walks. In Chitwan, a bird watching tour guide moves his hands as if he were shooting at a circle of enemies. Eyes and hands need to move fast in a place that has 450 species of birds. Have the best time watching these wonderful birds. Another activity to do is elephant bathing. Usually done in the morning, mahouts lead their elephants in the river to bathe them - and you are welcome to join the fun. Play with the elephants and take a dive in the river while on the back of the elephant. The elephant also splashes you with water from its trunk. Listen to the instructions of the mahout when bathing the elephants. To learn more about the ethnic Tharu community, visit a Tharu Village. The Tharus are an ethnic indigenous to the southern foothills of the Himalayas. They pride themselves as people of the forest, and build their communities around the forest. Tharus believe in animism and celebrate Hindu festivals. While in the village, you get to observe the lives of the Tharus, how their homes are built, what they cook and wear, etc. 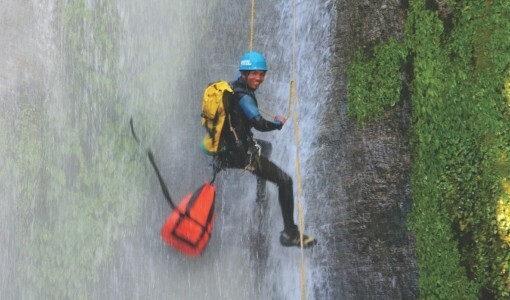 For an aquatic adventure, discover the thrill of canyoning at one of the best locations - Jalbire Waterfall Chitwan also known as Lamo Jharana. It is a twenty-minute walk from the Jalbire Temple. It is located in Chitwan National Park and is a popular destination to enjoy canyoning, swimming in river and to spend quality time. You can find various religious sites in Chitwan. The majority of people are religious with a major number being Hindus, followed by Buddhism and Christianity. People generally speak Nepali and the respective ethnic groups speak their mother tongue. The main festival to observe in Chitwan is Maghe Sankranti. It is the first day of Magh and people celebrate this festival by taking a ritual dip in holy river and getting together with their families. Devghat is the famous location to celebrate this festival. Sesame seed laddus, molasses, ghee, sweet potatoes and yam are prepared specially to serve in this day. The first day of Magh is also celebrated by the Tharu community as Maghi or New Year. They celebrate it by dressing up in the traditional Tharu wear. Bharatpur Airport and Meghauli Airport are the airports serving Chitwan National Park and Bharatpur city. 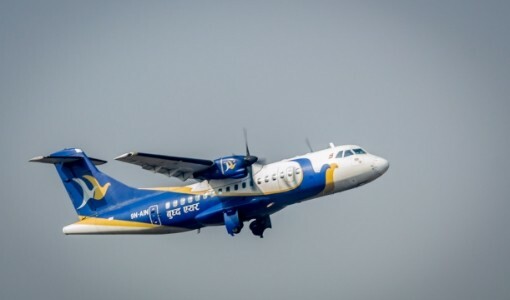 Buddha Air has daily flights from Bharatpur to Kathmandu and Bharatpur to Pokhara. The duration of flight from Bharatpur to Kathmandu is around 25 minutes and Bharatpur to Pokhara is around 20 minutes. A trip to Bharatpur is unlike any other you will experience in Nepal. An unforgettable tour that will make your journey both religious and adventurous, filled with wildlife experience.